The Reggae Boyz triumphed over a spirited Grenada team to win Digicel Caribbean Championship at the National Stadium last night. Jamaica receives the DCC Trophy and US$120,000 while rivals Grenada receive the 2nd place prize of US$70,000. After a penalty shoot-out, Guadeloupe secured 3rd place prize of US$50,000 and Cuba go home with the 4th place prize of US$30,000. 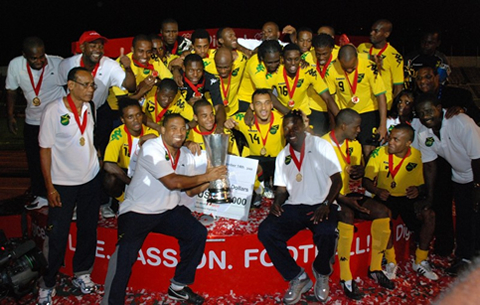 Jamaica will now look to carry on this winning form to the 2009 Confederation of North, Central American and Caribbean Association Football (CONCACAF) Gold Cup where their main challenge for the title will come from current cup holders The United States of America and regional powerhouse Mexico.